The souvenirs one brings back from a trip not only tell a lot about what that person values, but can also tell a lot about the place those souvenirs are from. Obviously it’s possible to get a magnet and a shot glass anywhere, but I easily could have purchased one hundred shot glasses per magnet. And 99 of those would have had the fleur-de-lis on them. 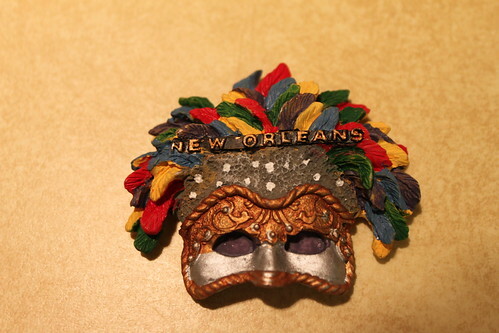 Naturally, I had to take home some Mardis Gras beads. 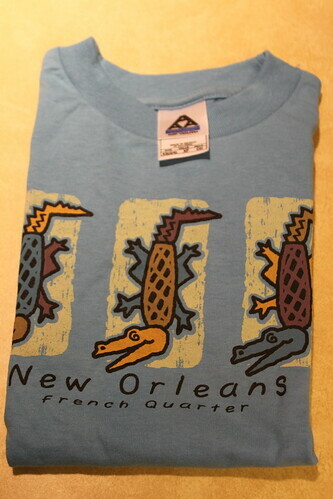 Fortunately, all I had to do to get them was go to Mardis Gras World. No flashing required. 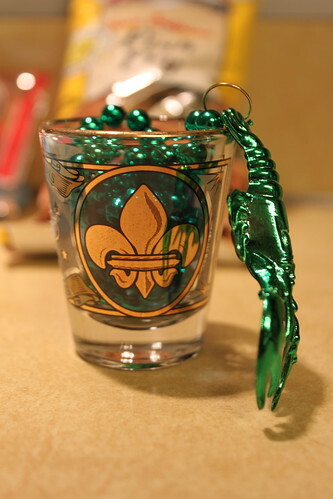 A shot glass and magnet were mandatory. The most appallingly delicious pie I have ever had. 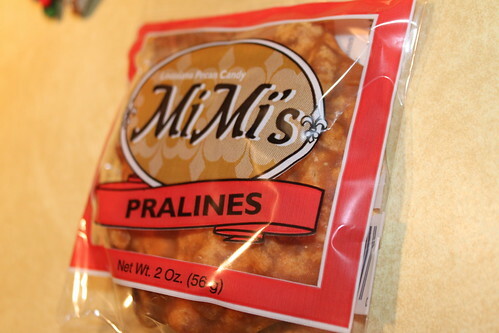 I ate two while I was there and brought two home with me. “Slap Ya Mama!” Um, enough said. The only reasonable t-shirt I could find for Alex. 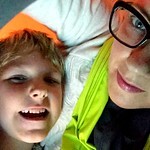 Most of them were neon or said inappropriate things (even for the tots) or had too many sequins or more glitter than is appropriate for anyone, boy or not. 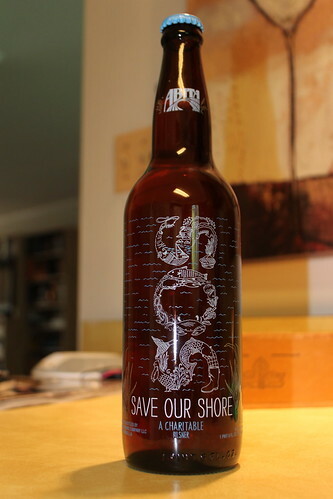 This beer is an attempt to help out with the oil spill. 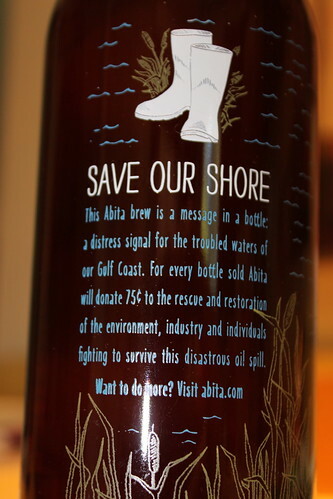 Remember: everyone drinks down there, so why not make a commitment to donate 75 cents for every purchased bottle? We drank one and then I purchased one to bring home. 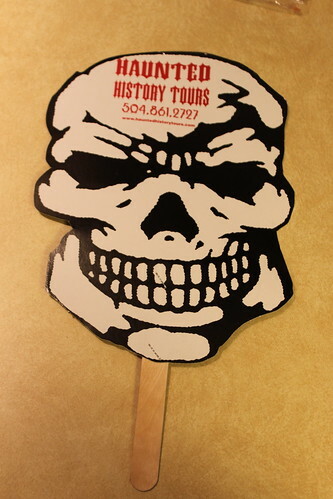 The Haunted History Tour paper fan. I didn’t use it on the tour, even though it was hot, because I was too busy enjoying the tour guide and the beer that we, as a group, stopped to get half way through the tour. The gift that my best friend bought for Alex’s birthday. 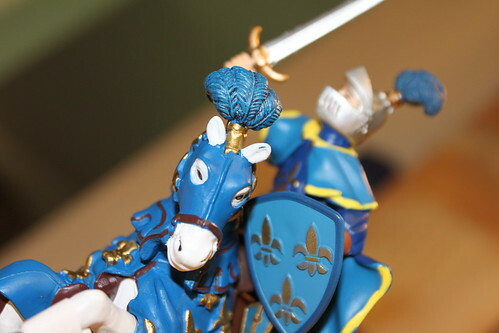 Of course the knight and his horse have the fleur-de-lis plastered all over them. Some Fish Fry. It was super cheap, and now I’ll be forced to make some fried fish. Plus: YUM. 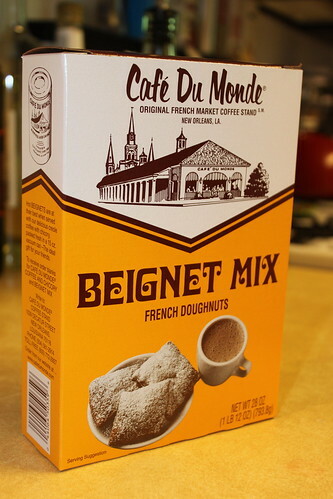 Some Cafe Du Monde Beignet mix. Again, I’ll now be forced to make them. Darn. OMG, Allison. This is so funny. Doug and I were just talking today about cool places in Pgh that we would love to have wedding or engagement pictures taken. 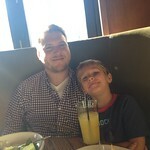 Most of what we came up with were restaurants and, of course, Whole Foods… all of which were completely not appropriate. We’re still up for suggestions. Those are some great souvenirs, Allison! All of them, really. 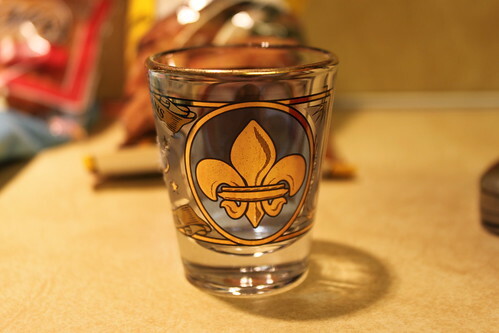 We always get shot glasses everywhere we go, and often magnets, but definitely shot glasses. Good find on the T-shirt, all things considered. I really like that blue, though, so I probably would have picked that one even if it wasn’t the only appropriate choice. 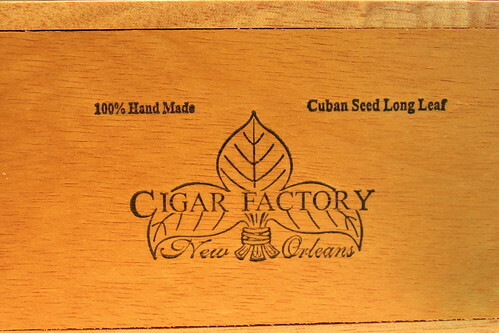 Funny how even the cigar box has the fleur-de-lis on it. And mmmmm, food! Those both sound excellent! The Cajun Seasoning selection was wonderful! And yes…lots of exotically-named ones. 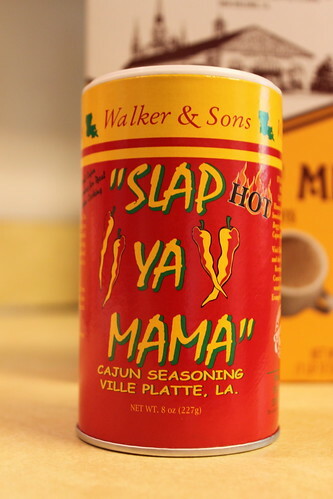 I was told by a few people that “Slap Ya Mama” was the best, and after putting it on our burgers the other night I must say it is delicious! 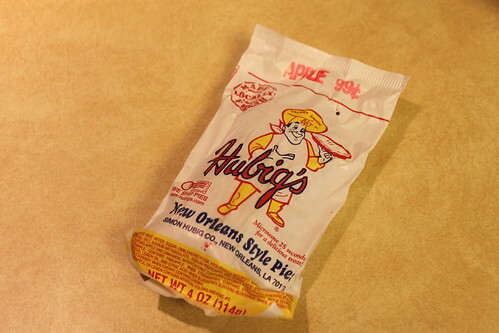 If you hadn’t returned with beignet mix, I would have been HUGELY disappointed in you. Good call on that one. 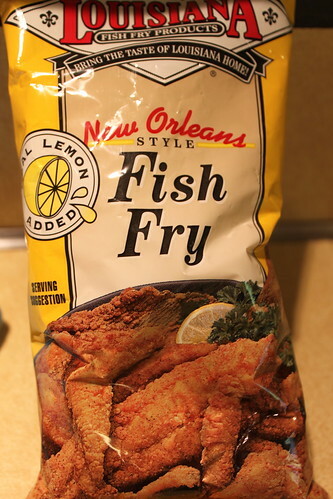 Yum…fish fry! I’d love it! sounds like an awesome trip! If I would have read this earlier I would have not been surprised by your enthusiasm for NOLA. Not that one needs a reason to be excited by the town, but I loved the sparkle as you talked about ghost tours.